The home we visit in this edition of homify 360 has a sensational, industrial yet eclectic-like charm. It’s welcoming and unique with a light and lovely atmosphere. The spacious house has been perfectly decorated in a captivating style that is aesthetically attractive yet glamourous, while the contemporary charm of this dwelling is beautiful and practical too. This functional and practical home is unique and attractive, and you’ll see why! Our first look at this timeless contemporary home shows off the attractive and well-lit interior. 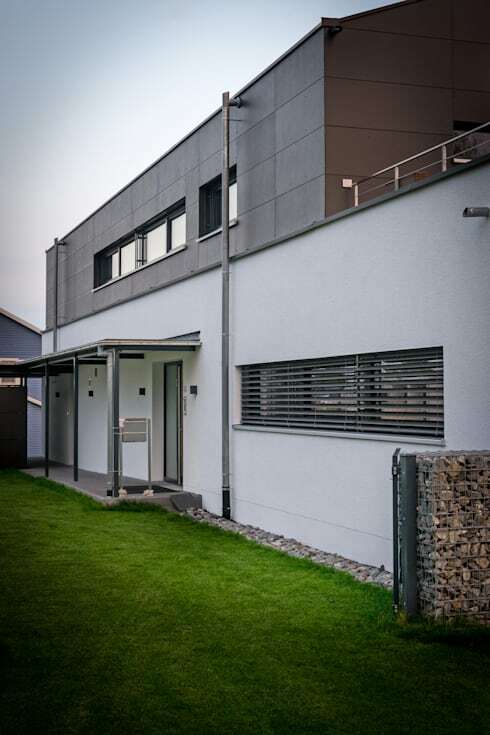 The simple white and grey façade is a smart choice that makes this exterior a trendy and sophisticated dream. 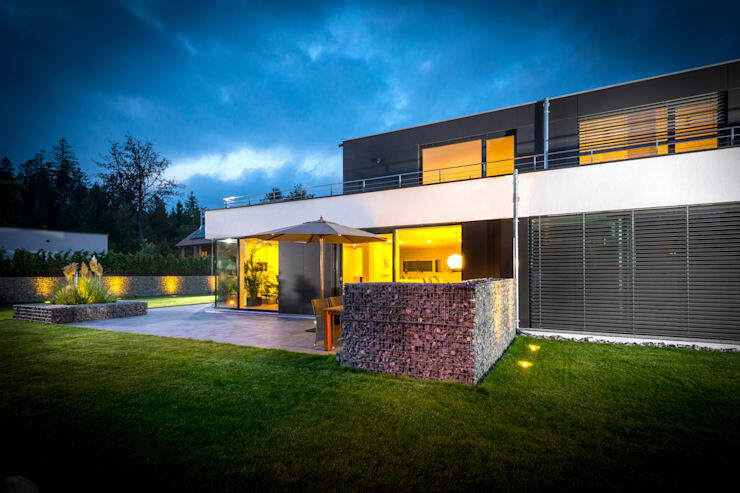 The architects opted for a flat roof to maintain that modern style, while the large yard is the perfect accompaniment for this striking house. Glazing plays an important role in the décor of the house, allowing the interior to be bathed in natural sunlight throughout the day. This home has an undeniable minimalist architecture, which is why the designers chose to go for a hidden entrance rather than a grand and opulent design. The modern home has been decorated in a simple, neutral colour palette, featuring white and dark grey. The contemporary colours along with the lush green lawn and stone décor makes this home a perfect space to enjoy both inside and out. 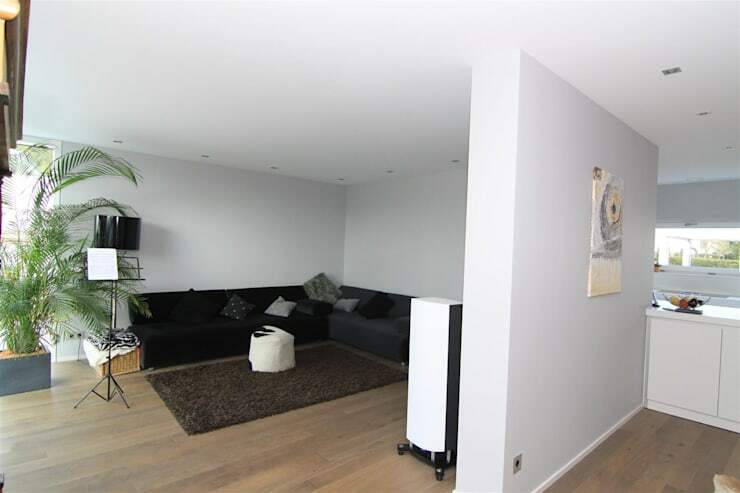 The living room is trendy and chic, styled with the minimalist, Scandinavian spirit in mind. The wooden floors are superb choice, while the white walls and shades of grey, along with the black furniture creates a tasteful décor that will remain fashionable for years to come. The striking accessories are designer pieces too, which includes the leather ottoman, fantastic lamp as well as the simple black lampshade that creates a classy atmosphere of style. You can’t go wrong with nature’s touch too, so the large plant is an excellent yet practical option for this room. This stylish and spacious kitchen is a fascinating choice for this minimalist-loving home style. The all-white cabinets, along with the large countertops ensure that there is both ample working space and storage in the kitchen area. The addition of wooden floors adds an attractive and cosy environment to this modern home, while the recessed lighting and spotlights will ensure that this space is perfectly illuminated in bright and shiny amazement. 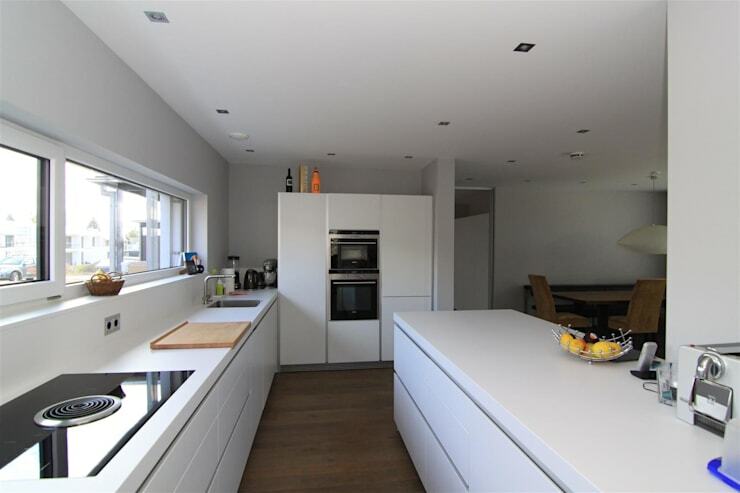 The modern appliances are a great choice, adding value to this beautiful kitchen too. 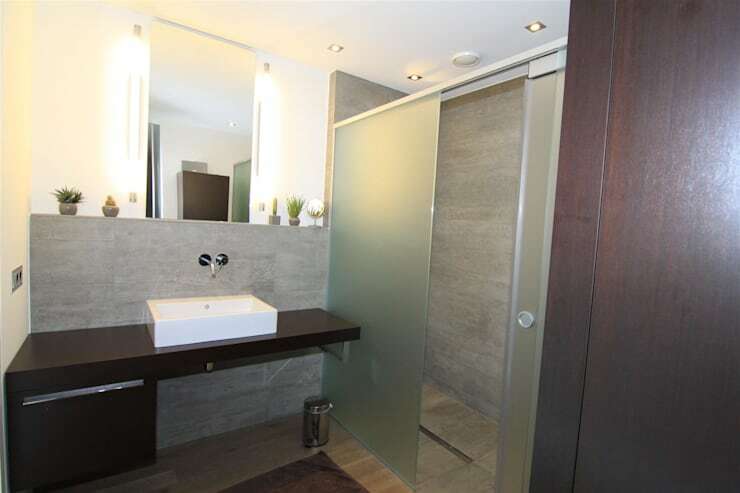 Although this bathroom may be small, the design is excellently planned to be spacious. Everything from the layout to the colour scheme creates an illusion of a larger, welcoming and cosy environment. The stone tiles are a fantastic colour, creating a warm and elegant bathroom, while the integrated shower, saves space in chic style too. The design of this bathroom is contemporary, and will remain trendy for a good few years too. 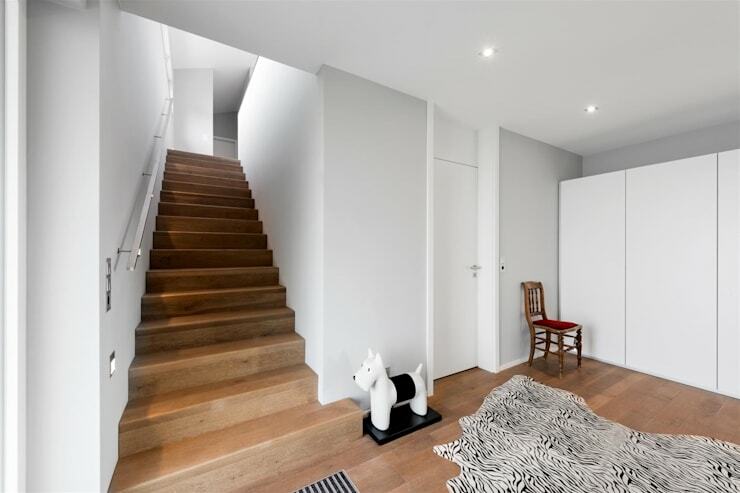 The corridor of this beautiful home is decorated in a fantastic Scandinavian style that combines white walls and wooden stairs. It’s bright and minimalist, while being warm and welcoming too. The striped carpet adds an originality décor element, while the addition of accessories adds to the quirkiness of the environment. The room is subtle yet attractive with an inconspicuous white wardrobe built into the wall for optimal storage space. The lovely home with a large terrace is worth a read too! What are your thoughts about this eclectic house?